Don’t let Shin Splints get in the way. Shin splints symptoms can include pain over the inside lower half of the leg. There can be pain at the start of running which often eases as it continues. This pain often returns after activity and may be at its worse the next morning. (TRUE!!) Sometimes you may get some swelling or lumps and may be felt when feeling the inside of the shin bone. Pain when the toes or foot are bent downwards can also be a symptom and although not common, a redness over the inside of the shin may occur. COMMON CAUSES- Understanding what causes shin splints can help you treat and prevent them from happening in the future. One of the most common causes is inflammation of the periosteum of the tibia. Traction forces on the periosteum from the muscles of the lower leg cause shin pain and inflammation. 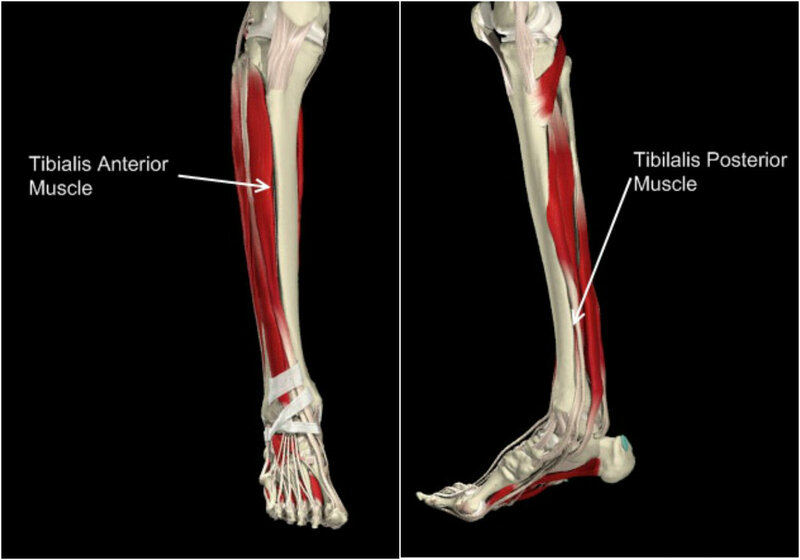 This has led to the use of terms such as Medial Tibial Traction Periostitis. Too much impact to the lower legs: If you’re a heel striker, the repetitive shock of your heels hitting the ground will irritate the fascia(tissue) in the muscles of your lower legs, especially your shins. When the fascia becomes irritated or inflamed you’ll feel discomfort in your shins that could worsen over time if no correction is made. It’s most common for people who first start running or jogging, once you figure out what is causing the problem and it’s corrected the pain should subside. BEST TREATMENT- The best thing to do when you are suffering from shin splints is to REST! You need to stay off your feet as much as possible. 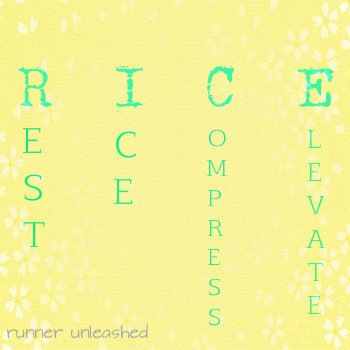 The most effective form of treatment is to do my favorite thing…R.I.C.E! Resting is an important part in all aspects of running as you give your muscles time to recover. But with shin splints you need to rest your legs, also icing them for 20 minutes at a time while keeping them elevated. Keeping your shins compressed enhances blood flow through your legs and to your muscles to help restore the damage. Shin stretches is also an excellent way to strengthen and treat shin splints. Doing “Toe walks” is a great help. Try to get on the tips of your toes and walk around for 30 seconds at a time, walk normal for 30 seconds and get back on your tips of your toes. Walking on your heels is very effective as well, this one is a little tougher to do while having anterior shin splints but the more your legs get used to it, then it will ease the shin pain. Spelling out the alphabet with your toes is an excellent exercise to do. Massage- You can kill two birds with one stone by taking a paper cup, filling it with water and put it in the freezer. Once its frozen start tearing the top half on the cup to expose some of the ice, use it to massage your shins in a circular motion. Depending on the severity of your shin pain, medium pressure should be a comfortable enough to handle. I sometimes do this although I prefer to get those reusable ice packs, hug my shins with it and wrapped it with an ace bandage for 20 minutes. The combination of the ice, the compression, and keeping my legs elevated is a MAJOR relief for shin pain. If it’s too severe to walk on, try ibuprofen, since it’s an anti inflammatory it will reduce swelling in your legs and ease the pain at the same time. Consult your doctor if you should take ibuprofen. If it isn’t the running surface, your running form, then check your shoes. Having the wrong pair of shoes with definitely cause shin splints. Especially if the shoes have a lot of miles on them. 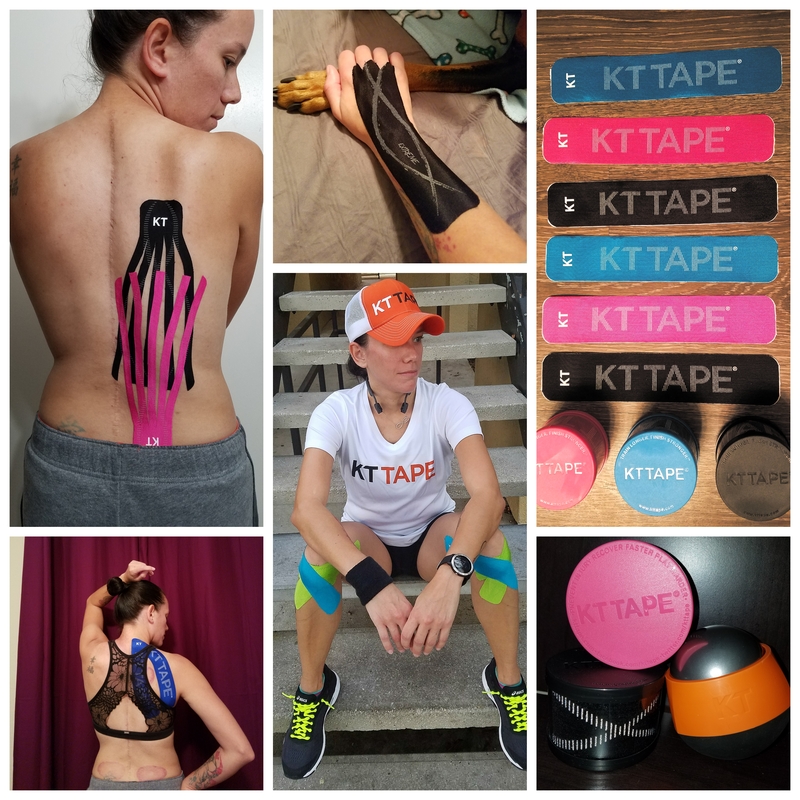 In addition to these tips, I also use KT TAPE to help with my shin splints.Yes, yes, I know I DO use KT Tape for everything!! It really does help me. I have a chronic problem with shin splints, because I have Scoliosis, where my left hip is higher than my right. So, it makes my right leg longer and closer to the ground, where as when I step with my left foot, the ground is a tiny bit farther away so my left side works harder and causes chronic shin splints. The tiny bit of distance makes a HUGE difference!!! It is a little complicated to understand but bottom line I do my best to keep them from coming back and know how to recovery quickly. The most effective way I have found to keep my shin splints from coming back is to wear KT Tape on my shins. 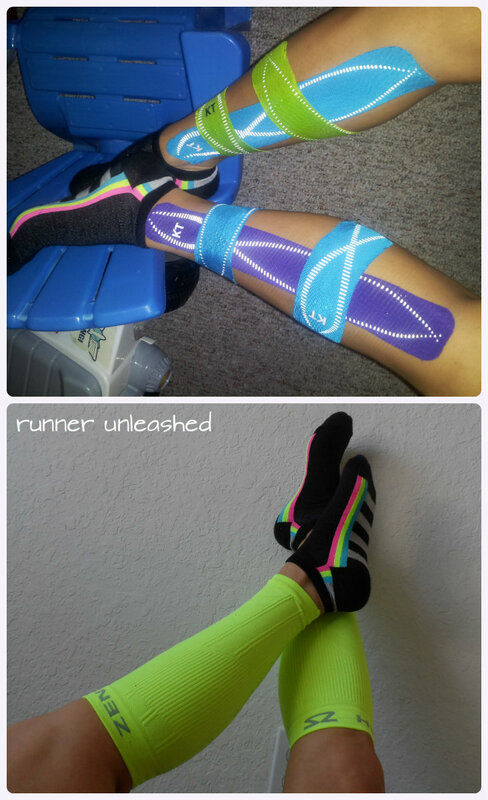 I used to get shin splints from running one mile…in January I ran a half marathon shin splint free thanks to KT Tap! I also own a few pairs of compression sleeves that help the calf muscle as well as provide compression for the shins. When I don’t have time to tape up or just going for a quick 4 mile run I wear my compression sleeves, and when I get home from running I will R.I.C.E it to prevent the shin splints from starting. Keep those steps light, try to run on the asphalt and check those shoes!!!! If all else fails R.I.C.E!!!!! A lot of great information! Can’t wait to try these and get some relief!! Love Love all the info & please accept my gratitude for your help, now I know I have anterior shin splints & that giving up is not an option! Thank You for sharing your journey & congratulations on being an amazing Momma, Wife & Person!!!! Do you tape your shins yourself? If so, where can I get this tape, and instructions on how to do it? It’s the only thing I haven’t tried. Thx! I was also suffering from shin splints really bad. It hasn’t been an issue for me, though, since I started using PowerStrips. Thanks for the info! I was wondering what compression sleeves you recommend? Hey Laurie!! I have a few pairs of Zensah calf sleeves, but I just got introduced to CEP compression socks and in the process of giving them a try. My husband uses a golf ball works great! I found that compression sleeves made my shin splints worse for me. I also hypothesise that the cause of my shin splints was due to continuing to run whilst putting on weight. Dropped a couple of some recently while increasing training and the shin splints are all but gone. Tight calves seem to go hand in hand for my shin splints so massage, stretching and rolling of the calves is a huge relieve for mine. Been pain free now for several weeks, despite huge increase in mileage. Really hoping that’s the last I’ll see of that particular issue, but some good info in your article for me either way. I agree with you. I have tried different brands of compression sleeves and some hurt me instead of help me. Since your calves and shins share muscles they do go hand in hand. Foam rolling your calves is a major help. I am glad to hear you’ve been pain free! I just ordered K Tape for my shin splints… I am running Boston in a few weeks and I just started getting shin pain.,. I am super nervous! I don’t want to give up on running Boston, but I also don’t want to cause stress fractures… appreciate any advice you can give me! Where is your pain and how bad is it? KT Tape will definitely ease the pain up. Are you icing? Stretching? Strengthening? Don’t let the nerves get the best of you. oh my heavens! I can’t tell you how helpful this is for me! I also have scoliosis where my left hip is higher than my right, do to a short right leg. This has been the most helpful for me. I am new to running and I have barely gotten to 2 miles and was ready to throw in the towel as say that running isn’t for me. Thanks for all this information! I am R.I.C.E ing right now! AWESOME Katie! Glad it helps you! Just found this write up and its got some great information. When you tape after a run, how long do you leave it on? Do you tape before you run? 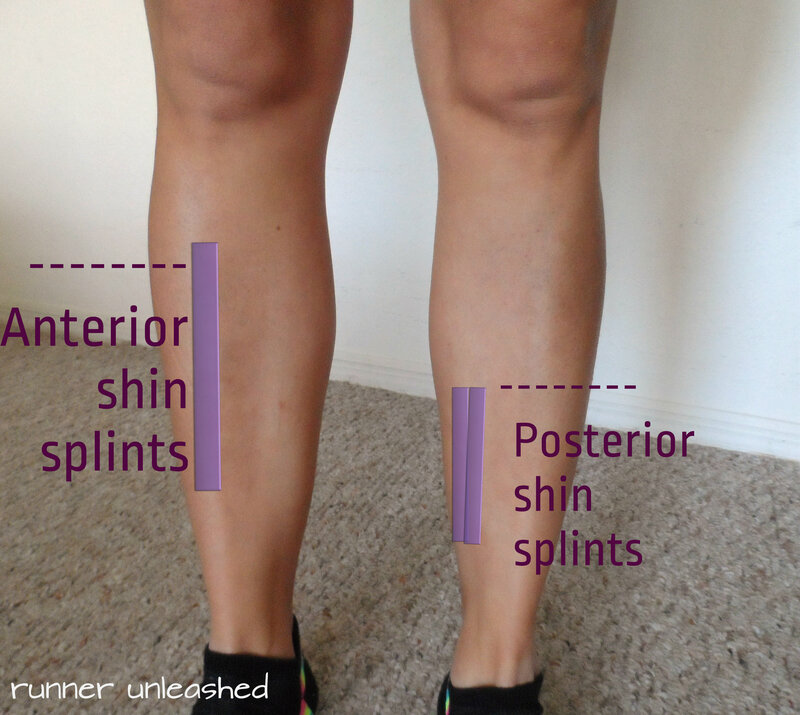 I’ve been suffering shin splints for a while now and really want to be rid of them. Icing helps but it still comes back. I haven’t tried taping so I think I better try. Thanks for the response 🙂 I taped it today (haven’t run yet) and it already feels better. I have Ragnar coming up in 6 weeks and was wondering, do you think I could pull it off if I’m taped up through my training and the race? Or would it cause it to get worse? I would continue icing and elevating as much as possible as well. I’m trying to decide if I should just pull out or if it’s do-able. Thanks! I run all my races taped up. It not only heals injuries but prevents them. So feel free to run the Ragnar with it on. If you feel thst it’s getting worse or your uneasy about running it them don’t. I would say to stop using the sleeves. They constrict the blood flow making it harder to repair the injuries. Using KT Tape would certainly improve your pain. Have you checked your shoes? How long have you been running? I know you wrote this years ago, but I am so glad to have stumbled upon it! I have a shorter left leg and scoliosis and deal with shin splints in that leg. I have struggled to find something to relieve the pain and wasn’t sure of the cause, but when I read this, it all made perfect sense! Thanks for the info! No problem! It took me a while to figure it out. But finally did and haven’t had shin splints in a long time. I echo Laura. I know its been a while since you wrote it but I’m grateful to have found it. I used to run, years ago, and dealt with shin splints constantly. It didn’t matter how much I rested, each “first run” back out after resting for weeks, or months, even years, my shin splints came right back. Recently I’ve become determined to work through it and get a place where I can run pain free and train to increase my mileage and speed eventually. I feel like I have gone overboard sometimes. I roll my entire leg, each side, focusing on the calf and the shins. I use compression sleeves while I sleep which helps with the morning pain which for me can sometimes be the worst. I do ice massage twice a day. I have new shoes that I was fitted for after a gait analysis. Ibuprofen/Curamin (a natural anti-inflammatory agent) if it gets bad. Decreased my mileage (which is low anyways since I’m only just now getting back into running after a solid 2-3 years off). Elevate my shins and rest whenever possible. So, really, I feel like taping is my next (last?) hope. I’m really praying it works. Thanks for the hints. I think I have both anterior shin splints, but they also creep pretty high up my shins though stay on the inside of my leg, not on the outside of the tibial spine. I almost feel like it changes day to day the position and intensity of the pain. Do you think it would be worth combining these taping methods together on a single leg to account for the physically higher up pain? Thanks again! Hey lady, I think you should just use one strip along your shin. Half on bone half on muscle. Don’t give it too much stretch, if any, just a tiny bit. Have you had it checked out? Very helpful information. Thank you for sharing in such detail! Taping is definitely a huge help for shin splints! Thank you so much for the article. I’m just starting a workout plan that involves running with the couch to 5k program. (I AM pretty out of shape and a little overweight.) My problem is I’ve been having severe shin splints to the point I can’t run more than 1 minte. So frustrating! I did just buy a spendy pair of running shoes and a pair of cep compression sleeves. I’m also going to try different exercises/stretches and the RICE method 🙂 do any of you more experienced runners have any other tips? I so badly want this to work! It could be a number of things. The running surface for one and def need to check the shoes. Are you sure you were put in the correct shoes? Try to do some stretching. strengthening your calves will help ease the pain too. This is the first time I get shin splints and they are very painful but I am in military training and must keep running to keep my physical fitness score up. What do you recommend? Or is it a must to rest? This was super helpful! I suffer it only in my left leg. I wonder if that means any significant? Either way I will be getting the KT tape. Thanks for sharing all of this! 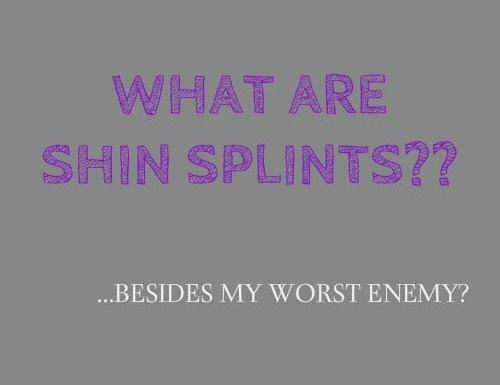 I have shin splints right now and I am struggling to train for my race this weekend! Tomorrow I will try to wrap it with an ace bandage to run. I put KT tape on it yesterday and haven’t had a whole lot of relief. I have KT tape on both knees and my foot so my one leg looks ridiculous!! Previous Previous post: Stay hydrated!! !